The crystal gurus at Energy Muse have taught us everything we need to know about how to use crystals. In this comprehensive A to Z guide on how to use crystals daily below, we’re sharing the meaning and uses for over fifty unique healing crystals. Stash this link in your bookmarks and refer to this guide anytime you have a specific crystal question. This guide to healing crystals comes from the pages of Energy Muse’s recent book, Crystal Muse. For more tips on crystals, check back every month to learn from Energy Muse monthly column. Amethyst: a natural stress reliever that also encourages inner strength, peace, spiritual growth, and intuition. Learn how to use crystals like amethyst to attract positive energy while also clearing out any negative energy. Angelite: connects you with your angels to protect your entire body. It also helps to relieve tension, stress, and anger while facilitating forgiveness and stimulating healing. Apophyllite: a high vibrational crystal that emanates light to spiritually energize your soul. Holding it helps to immediately reduce stress, fear, anxiety, and worry. Aventurine: one of the luckiest crystals, especially for manifesting prosperity and wealth. Its lucky energy is said to boost your chances or odds in any situation. Basalt: a dark, volcanic rock caused by the rapid cooling of basaltic lava. It brings stability, promotes courage, and also raises your energy levels. Black Kyanite: a balancing crystal that’s beneficial for space clearing, energetic protection. In addition, it is great for letting go of things that are no longer aligned with your highest good. It helps you align all your chakras, removing any imbalances or blocks within each center. Black Obsidian: holds a spiritually grounding vibration that connects you with the energy of the earth. It also provides psychic protection and clears any negative energy from your aura. Black Onyx: a powerful, protective crystal that helps to shield your mind, body, and spirit from negative energy. This stone protects your personal energy field and helps to calm your fears, leaving you feeling more secure and safe. Bloodstone: removes any energy blockages and negative energy from your body and aura. It increases endurance, promotes stamina, and brings energy. Blue Lace Agate: one of the best crystals for anxiety and stress relief. Its calming blue color emits soothing vibrations that bring peace of mind and relaxation. Blue Apatite: a motivational and inspirational crystal that clears your mind, strengthens your personal power, and stimulates creativity. Many use this crystal to assist with their weight-loss goals as well. Carnelian: a crystal of courage, vitality, sexuality, confidence, and action. It activates the first three chakras, as a result it bring a surge of life force and creative energies. Celestite: known for inviting angels into your space and fostering your connection with the higher realms. It holds a gentle, uplifting energy that relieves heavy moods, sadness, and anxiety. Chrysocolla: a peaceful, soothing crystal that brings comfort in times of stress, change, and transition. It also promotes clear communication and self-expression, and it increases your capacity to love. Chrysoprase: encourages joy, optimism, and happiness, activating and opening your heart chakra. It reminds you to allow yourself to receive with an open heart. Citrine: a gemstone of light, happiness, abundance, and manifestation. Most noteworthy, it’s one of the few crystals that doesn’t hold negative energy. 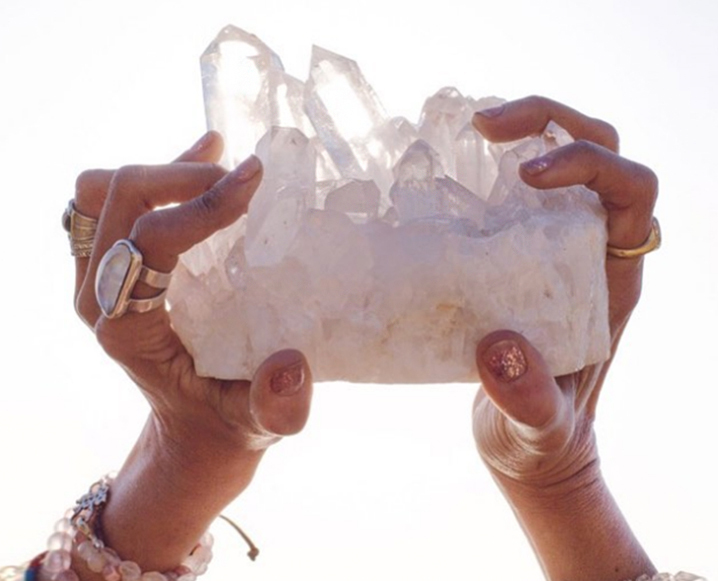 Clear Quartz: a stone of clarity that activates and amplifies your programmed intention. It also raises the energy level of any other crystals it comes into contact with. Crystal Grid: a powerful tool for manifesting goals, desires, and intentions that unites the energies of the crystals, a sacred geometric pattern, and your intention. The combination of these three things helps to manifest results much faster. Learn how to use crystals in a grid here. Dumortierite: referred to as the stone of patience, opening the doors of insight and activating the third eye chakra. It enhances your willpower in regard to learning. Flame Aura Quartz: also called Titanium quartz or rainbow quartz; a crystal that clears energy blocks, fear, and doubt, especially those impeding creativity. Connecting with its rainbow energy is said to shed light on your spiritual purpose in this lifetime. Fluorite: a crystal that houses rainbows, it helps to restore balance and bring order to chaos. Fluorite also heightens your focus and brings clarity of mind. Fuchsite: often called the fairy crystal, as it leaves green and gold sparkling flecks, like fairy dust. It encourages joyfulness, relaxation, and miracles, connecting you with your heart on a deeper level. Garnet: a stone of passion and energy that ensures the smooth flow of energy throughout the body. It connects with your root chakra to help you feel more grounded and connected to yourself in the present moment. Goldstone: an energy generator that helps you achieve your goals because flecks of copper deflect any unwanted energies. Green Calcite: radiates soothing and calming energies to restore balance to the mind, body, and spirit. Furthermore, it helps to dissolve old energy patterns and belief systems to bring in money and prosperity. Hematite: the ultimate grounding stone that leaves you feeling more balanced, calm, and centered because it eliminates any negativity from your body, drawing it from you into itself. Indigo Gabbro: a magical, intuitive, and spiritual stone that’s wonderful for meditation and connecting to the spiritual realm. Its energy grabs you and pulls your energy down toward the earth’s core, helping you to feel focused so that you can overcome distractions. Jasper: said to symbolize the blood of the earth. It connects you deeply with the vibrations of the earth, bringing grounding energy and maybe even a deeper understanding of the power of nature. Kambaba Jasper: provides you with the inspiration and courage to confront your fears head-on. It also alleviates stress and restores balance to your mind, body, and spirit. Kunzite: a heart-based crystal that fills your life with the energy of love. It’s also a beneficial crystal for relieving anxiety, stress, and even sleep issues like insomnia. Labradorite: a crystal of destiny, awareness, and power that connects you with the energy of light, it creates an energetic shield that protects your aura and strengthens your personal energy supply. Lapis Lazuli: a crystal of awareness, insight, and truth. It is one of the oldest gemstones, one that has existed in ancient tales since the beginning of time. The famous golden sarcophagus of King Tut was heavily decorated with Lapis Lazuli stones. Lemurian Quartz: considered one of the “master crystals,” teaching oneness and helping you to embrace your own individuality, the crystal’s grooves or ladder-like striations are said to act as a “stairway to heaven,” unlocking hidden messages and information stored within the crystal. Lepidolite: fosters tranquil, peaceful, and calming energy. It’s one of the best crystals for relieving anxiety because it naturally contains lithium. Learn how to use crystals and connect with this stone in times of stress and chaos. Lithium Quartz: promotes emotional peace, stress relief, and relaxation. It’s a powerful yet gentle stone that uplifts your mind, body, and spirit. It gets its pink color from the natural presence of lithium, which is often used in antidepressant and antianxiety medications. Malachite: a stone of transformation that works to clear and cleanse the heart chakra. It helps to balance the mind to relieve scattered and unfocused feelings. Mookaite: brings strong healing, grounding, and protective energies. Found in a range of vibrant, earthy colors, this stone encourages your sense of adventure and pushes you out of your comfort zone. Moonstone: the stone of destiny. Strongly connected with the energy of the Moon, it balances the yin or feminine energy within the body. It’s also one of the best crystals for fertility. Moss Agate: connected with nature and the spirit of the earth. It brings new beginnings and promotes the release of old habits, as it also attracts wealth and abundance. Nuummite: one of the oldest minerals on earth formed over three billion years ago. It draws out negative or outside energies to purify your energy field, bringing stability and grounding energies to help you sleep. Ocean Jasper: the ideal crystal for lifting your spirits, it allows you to find happiness in the present moment, calming the mind, body, and spirit to create a constant state of bliss. Orange Calcite: an energizing stone that helps to get positive energy moving throughout the body, especially in areas of creativity and sexuality. It’s a wonderful stone to carry whenever you’re embarking on a new journey or endeavor. Peacock Ore: resembles the vibrant colors of a peacock’s tail. It’s a stone of creativity, happiness, innovation, and blessings that increases creative energies and stimulates new ideas. Phantom Quartz: occurs when the growth of the crystal is interrupted. Then the crystal begins to grow again. Each mineral deposit appears like a “ghost,” or another crystal within the crystal, showing the life story and evolution of the crystal. Pyrite: invites in success, prosperity, and wealth because its reflective surface deflects negative energy to act as a shield of protection. Rainbow Obsidian: nurtures and rejuvenates the heart after the experience of an emotional trauma, such as a broken heart, mourning the loss of a loved one, or a period of grief. Additionally, it helps to heal the heart and rejuvenate the emotional body. Red Jasper: a powerful gemstone of protection and stability, it inspires a positive attitude, increasing your motivation and energy level to encourage you to take action in your life. Rhodonite: a stone of forgiveness and compassion. Referred to as the rescue stone, it carries a powerful healing vibration that releases fear and can help with relationship problems. Rose Quartz: opens the heart to all types of love—love for yourself, love for your family, romantic love, and love of everything on earth. Learn how to use crystals like rose quartz to help to raise your self-esteem, restore confidence, and balance the emotions. Ruby Zoisite: a combination of fiery ruby and earthy zoisite. Due to it’s ability to hold the energy of passion and patience, it’s a stone of the heart that balances the male and female energies within the body. Smoky Quartz: a grounding and stabilizing stone that brings centering energies. It also helps to overcome negative emotions such as stress, fear, jealousy, and anger. Sodalite: due to its high salt, manganese, and calcium content, this stone has a harmonizing and soothing effect on the body. It helps to strengthen your confidence, communication, inspiration, and intuition. Sunstone: carries the light and happy energies of the sun. It’s a very protective stone that stimulates your personal power, creativity, strength, and leadership qualities. Tangerine Quartz: connected with the sacral chakra, this crystal promotes creativity, emotional balance, and sensuality. It also reminds you to keep a healthy balance between the giving and receiving aspects of your relationships with friends, family, and your partner. Tectonic Quartz: clear quartz crystals that are millions of years old. The striations and grooves on these crystals were created from movement in the tectonic plates deep within the Earth. Tiger’s Eye: a solar stone of courage, strength, will, and personal power. It helps you to see the positive in any situation and increases feelings of optimism. It’s also wonderful for bringing new opportunities, prosperity, and wealth. Tourmalinated Quartz: a combination of clear quartz with inclusions of black tourmaline, it deflects negative energy while also helping to unlock any energy blockages within the body. Tree Agate: connects you on a deeper level with the earth and nature and clears blockages within your body’s energy field to open the flow of abundance and prosperity. Turquoise: known as the master healer, it’s said to be the bridge between heaven, sky, and the earth. As a throat chakra stone, it fosters honest and open communication from the heart. Unakite: balances the heart chakra and the male and female energies that lie within everyone. It’s a powerful stone for emotional healing, allowing us to address the negative emotions we’re holding onto and transform ourselves from a place of love. Vanadinite: strongly associated with the element of fire and the sacral chakra, this crystal is a strong creativity and energy booster. Additionally, it helps you to become more focused on your tasks, clearing any blocks—especially those impeding creativity. Zebra Jasper: unites the yin and yang energies. The white and black coloring represents balance, therefore it allows us to see the good in a “bad situation,” and recognize the “bad” in a good situation to realize the truth of any situation. Want to learn more about how to use crystals daily? Get some inspiration and ideas to try out here! Share the post "The Ultimate Crystal Guide: How To Use Over 50 Healing Crystals"
Thanks so much…love healing with crystals! so how do you use them? thank you for what they each can be used for, but I must have missed the “how” part. “Want to learn more about how to use crystals daily? Get some inspiration and ideas to try out here!” is at the bottom of the article. Thank you for sharing this useful post. These are the really helpful guidance of healing crystals for beginners. Crystals have a calming effect and the more we interact with them, the more we can feel their healing energies! Kodus to you for this wonderful article. Excellent information, thank you very much for sharing, today society does not appreciate the value of the crystals and all the power they contain. It’s great to see how there are still people who take the time to talk to them.